Echo Design, online as echodesign.com, is the destination for designer apparel, home decor, and more. Echo Design offers great deals on designer apparel, home decor, and more. Echo Design carries scarfs, wraps, swimwear, bags, loungewear, bedding, bath items, home decor, gifts, and more. Stop by RetailSteal.com for the latest Echo Design coupon codes, Echo Design promo codes, and Echo Design discount codes. Echo Design offers ground shipping to the United States. Use code at Echo Design and save 30% on swim & beach. Click for code. Use code at Echo Design and save 20% on orders $150+. Click for code. Use code at Echo Design and save 20% on any order. Click here for code. Use code at Echo Design and save 15% on any order. Click here for code. Save up to 30% on sale items at Echo Design. Click here to shop. 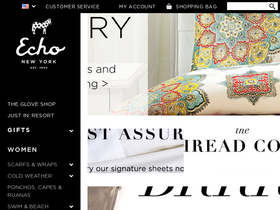 Shop at Echo Design and enjoy free shipping on bedding orders $199+. Click to shop. Enjoy free shipping on accessories orders $99+ at Echo Design. Click to shop.